Jacksonville, Florida – Providence Homes is excited to announce the release of Tollerton at Durbin Crossing in St Johns. This new neighborhood will feature 53’ home sites that are completely surrounded by pristine conservation areas. At Tollerton in Durbin Crossing, Providence Homes will offer 100% ENERGY STAR Certified homes starting from $214,940 and ranging to the mid $300’s. Pre-selling is already underway. There are several oversized wooded conservation cul-de-sac home sites to choose from but they won’t last long. All Tollerton residences will have access to the state-of-the-art recreational amenities, pools and playgrounds which have made Durbin Crossing in St Johns County one of the most popular family destinations in the area. 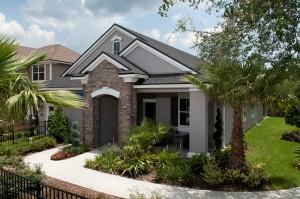 Providence Homes has built more than 2,500 homes for Jacksonville families. As one of the area’s largest locally owned builders, we are committed to building beautifully designed, 100% Energy Star certified homes at an affordable price. No matter which neighborhood you choose, Providence Homes has been a name families can trust for more than 20 years. The Durbin Crossing Model Home Center is open Monday-Thursday & Saturday from 10AM-6PM and Friday & Sunday from 12-6PM. Call for details or additional information 904-271-1223 LOCATION: Traveling South on US 1 (Phillips Hwy) turn right onto Racetrack Road and proceed west. Turn left onto St. Johns Parkway (CR2209) then turn right onto Longleaf Pine Parkway (CR244) then turn left onto Durbin South Parkway. Turn right on Islesbrook Parkway (past South Amenity Center) then left onto Willow Winds Parkway to Providence Model Home.